Volunteerism "I have trouble saying no. If I can, I will; if I can't, I will find someone who can." 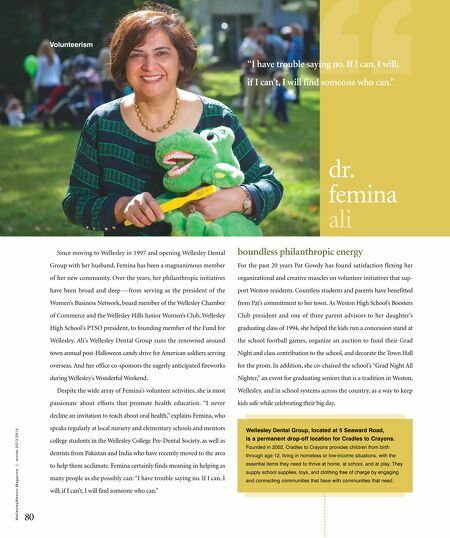 dr. femina ali Since moving to Wellesley in 1997 and opening Wellesley Dental boundless philanthropic energy Group with her husband, Femina has been a magnanimous member For the past 20 years Pat Gowdy has found satisfaction flexing her of her new community. Over the years, her philanthropic initiatives organizational and creative muscles on volunteer initiatives that sup- have been broad and deep — from serving as the president of the port Weston residents. Countless students and parents have benefitted Women's Business Network, board member of the Wellesley Chamber from Pat's commitment to her town. As Weston High School's Boosters of Commerce and the Wellesley Hills Junior Women's Club, Wellesley Club president and one of three parent advisors to her daughter's High School's PTSO president, to founding member of the Fund for graduating class of 1994, she helped the kids run a concession stand at Wellesley. Ali's Wellesley Dental Group runs the renowned around the school football games, organize an auction to fund their Grad town annual post-Halloween candy drive for American soldiers serving Night and class contribution to the school, and decorate the Town Hall overseas. 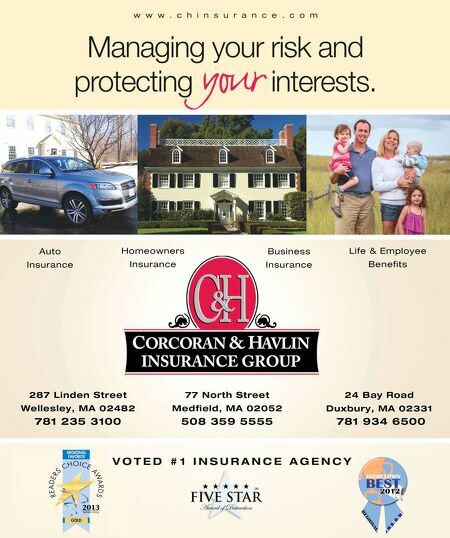 And her office co-sponsors the eagerly anticipated fireworks for the prom. In addition, she co-chaired the school's "Grad Night All during Wellesley's Wonderful Weekend. Nighter," an event for graduating seniors that is a tradition in Weston, Despite the wide array of Femina's volunteer activities, she is most passionate about efforts that promote health education. "I never Wellesley, and in school systems across the country, as a way to keep kids safe while celebrating their big day. We l l e s l e y We s t o n M a g a z i n e | w i n t e r 2 0 1 3 / 2 0 1 4 decline an invitation to teach about oral health," explains Femina, who speaks regularly at local nursery and elementary schools and mentors college students in the Wellesley College Pre-Dental Society, as well as Wellesley Dental Group, located at 5 Seaward Road, is a permanent drop-off location for Cradles to Crayons. Founded in 2002, Cradles to Crayons provides children from birth dentists from Pakistan and India who have recently moved to the area through age 12, living in homeless or low-income situations, with the to help them acclimate. Femina certainly finds meaning in helping as essential items they need to thrive at home, at school, and at play. They supply school supplies, toys, and clothing free of charge by engaging many people as she possibly can: "I have trouble saying no. If I can, I will; if I can't, I will find someone who can." 80 and connecting communities that have with communities that need.